The International Alliance announced on Monday, continuing to support Iraq in all areas and support. "The President of the Republic, Barham Salih, received today, in the city of Sulaymaniyah, US Special Presidential Envoy for the International Coalition Against Terrorism, James Jeffrey and his accompanying delegation," the Presidency said in a statement received by Mawazine News. "The meeting reviewed the latest political and security developments on the Arab and regional levels and stressed the need to achieve peace and stability and find solutions to the crises and conflicts that are afflicting the region," the presidency said. President Saleh stressed, "Iraq's keenness to expand the horizons of joint cooperation between Iraq and the United States in all fields, and the importance of coordination between the two sides on the security and political developments," stressing that "
"The United States supports Iraq in various fields, especially in the war on terrorism and its contribution to the reconstruction of the affected areas," he said. Jeffrey reiterated his country's determination to "continue its support for Iraq and its support for progress and advancement in all fields and to take its leading role in the region," praising "the victory against terrorist gangs." US Vice President Mike Bens on Monday discussed with Iraqi Prime Minister Adel Abdul Mahdi the strategic partnership between the United States and Iraq and the reconstruction of the country after the defeat of the "Dahesh". 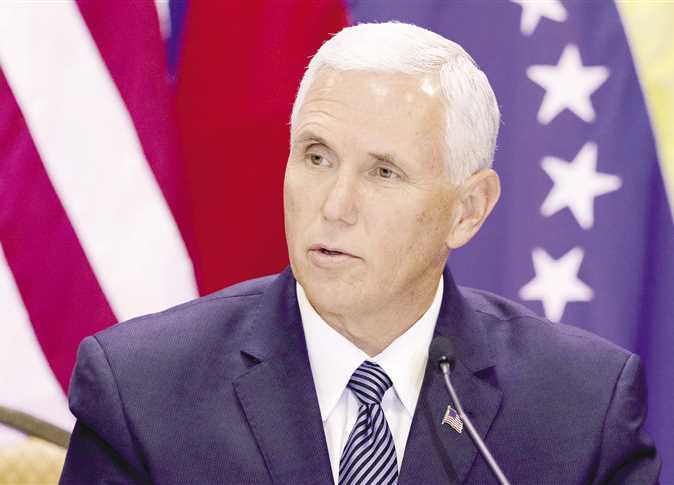 said US Vice President Mike Pence Monday that he had telephoned the Prime Minister Adel Abdul Mahdi , stressing parking United States with Iraq to defeat the remnants of the terrorist organization Daesh. "I concluded with the Iraqi prime minister and thanked him for his strong support for the permanent partnership between the US states and the Iraqi people," Pines said in a tweet on his Twitter account. "The United States stands with Iraq to defeat the remnants of the Baath and help the Christian and Yazidi communities to rebuild and recover from years of terrorism and war." 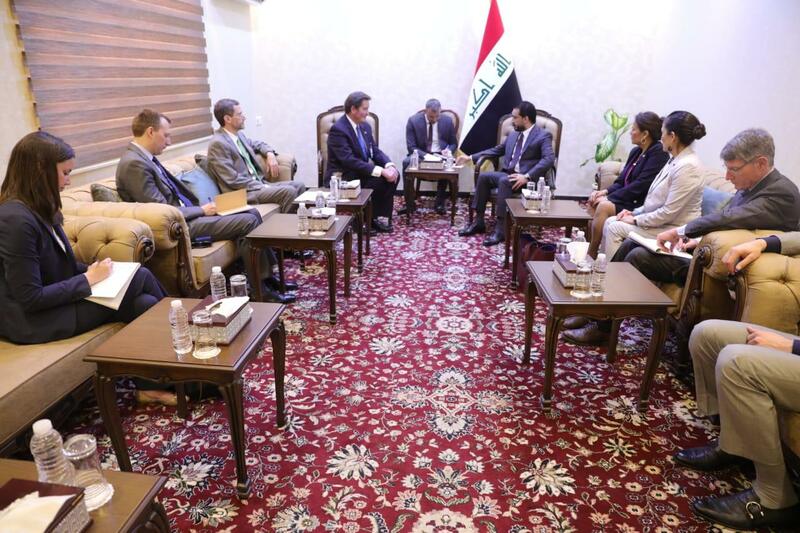 US delegation confirmed on Tuesday its support for the Iraqi government in implementing its government program and providing the environment to attract international companies. "The Speaker of the House of Representatives Mohammed Al Halbusi received today a delegation from the US Congress headed by MP John Garamendi and in the presence of the Charge d'Affaires of the US Embassy in Iraq, Joe Hade," the Information Office of Halaboussi said in a statement received by Mawazine News. "The meeting discussed the strengthening of joint cooperation between Iraq and the United States in the interests of both countries, as well as the political and security developments in Iraq and the region, bilateral cooperation in the field of combating terrorism and eliminating extremist ideology and gang cells, . The statement stressed that "the need to support the Iraqi government to implement its government program is emphasized; to deliver services and provide citizens' requirements and to continue the efforts to restore stability; to ensure the return of displaced persons and provide an environment conducive to women and children and immunization of extremist ideology and social protection." He added that "the meeting dealt with the investment file in Iraq, and provide the environment to attract international companies in general and the United States in particular; to move forward in the stage of construction and reconstruction to ensure the provision of necessary services for citizens and provide employment opportunities." Prime Minister Adel Abdulmahdi said on Tuesday that he had received "assurances of continued US and British support for Iraq." Prime Minister Adel Abdul Mahdi received on Tuesday a delegation from the US Congress. A statement from the Prime Minister's Office said that Abdul-Mahdi received in his official office today a delegation from the US Congress led by Democratic Representative in the State of California John Karamende. 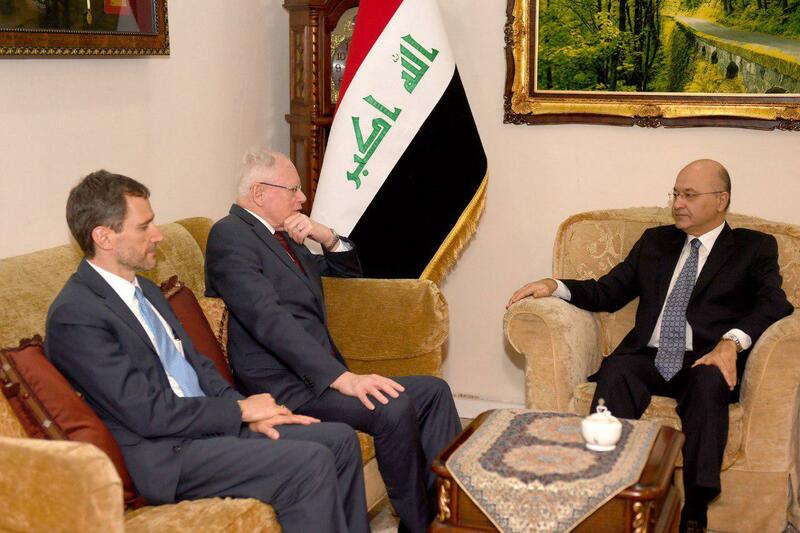 He expressed US support for the efforts of the Iraqi government and keenness to continue cooperation against terrorism, reconstruction and humanitarian aspects. The delegation praised the government's policy of opening up to its Arab and regional environment and exchanging visits that enhance Iraq's status, stability and prosperity. For his part, Abdul-Mahdi stressed on the importance of relations between the two countries and the need to continue with the assistance of Iraq to face the remnants of the Iraqi army and training. He pointed out the importance of the movement witnessed by Iraq and the reception of many presidents and officials in Baghdad within the government's approach to Iraq as a point of convergence and peace. An economic network that promotes security and stability in the region. " Prime Minister Adel Abdulmahdi and US Vice President Mike Pines on Tuesday stressed the strengthening of the partnership relations between the two countries. "A telephone call was made between Prime Minister Adel Abdul Mahdi and US Vice President Mike Pines, during which he stressed the support and strengthening of partnership relations to serve the interests of the two peoples, and continue to support the efforts of the Iraqi government to eliminate the remnants of the terrorist advocate, Reconstruction of Iraq and stability in the liberated areas. " 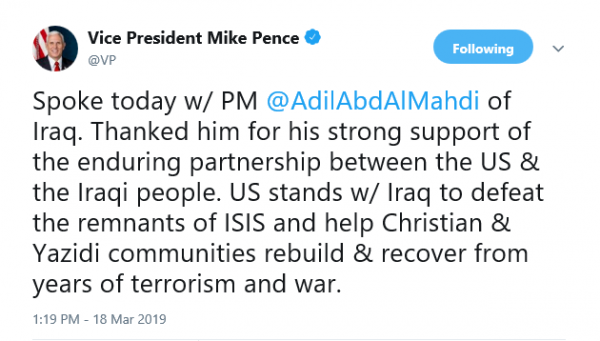 He praised the US Vice President, according to the statement; "the support of the Prime Minister for the rights of religious minorities and follow-up affairs of Yazidis and the pursuit of reconstruction of liberated areas in order to return all the displaced to their homes." The US embassy in Baghdad confirmed Wednesday that a congressional delegation had visited Baghdad and Erbil, saying it had informed officials of the presence of troops in Iraq. The embassy said in a statement received by "Al-Gharab Press" a copy of it, "The visit of a delegation of the Committee on Armed Forces of the US Congress to Baghdad and Erbil on March 18 and 19 to discuss US-Iraqi relations." "Members of the House of Representatives met with John Garamendi of the Democratic Party of California, Deb Haland of the Democratic Party of New Mexico and Veronica Escobar of the Democratic Party of Texas in Baghdad with Prime Minister Adel Abdul Mahdi, Iraqi MPs Mohamed Halboussi. " "They met in Erbil with the Prime Minister of the Kurdistan Regional Government, Nechirvan Barzani and Deputy Prime Minister Qubad Talabani, where members of the US Congress discussed the importance of the relationship between the United States and Iraq and the future of bilateral cooperation, especially ensuring the permanent defeat of the organization and the continued role of the United States in advising the security forces Iraqi training ". "The delegation stressed that, at the invitation of the Iraqi government and in partnership with the Iraqi security forces, the US military forces in Iraq should remain part of the international coalition for an urgent defeat, and this ongoing partnership must respect Iraq's sovereignty while working with the Iraqi security forces to achieve the common goal To ensure the permanent defeat of violent extremist organizations such as a hasty organization in Iraq. " "The delegation looks forward to the arrival of the day, which provides a stable and secure environment in Iraq welcomes foreign investment and economic development to provide a prosperous future for the people of Iraq."